Hello all ….sorry for not posting yesterday…strucked in some works …didnt get time to post…..
pls ignore mistakes …humble request…. After getting conscious Maahi cant handle the affection nd concern of Anvi towards him…..he want to know the reason …when she came to the room to tell as she is going out …. She was stopped nd turned to him…..she was surprised to his way of addressing her…. When he got angry on her regarding the matter of her friendship with Shiv..even in that utmost anger also he didnt call her with her full name even he knows her name…but now he is addressing her with her full name…. She looked into his eyes to understand the reason that hid behind his behavior…. “reason hai….u know I am the reason for Shiv’s present condition…..u know I am the reason for his broken marital relation….u know I am the one who behind his pain….. u know what I did with him nd even u know bcz of me he stood in front of death …phirbhi why dont u hate me….why u made friendship with me….why u r respecting me?”…he again questioned her..
She understood that something happened nd he came to know the matter about Shiv…. But she forgot that bcz of her he came to know about Shiv…. She understood how he got the matter….nd scolded herself for her foolish act…. when she asked him she didnt mind that he know Annika …even she didnt think that he will go nd give keys to her ..her focus laid on only two things..one is how to handover the keys to Annika nd how to face Shivaay…but she didnt think of Maahi..if she thinks of it for a while she never ask him that help…bcz she cant see him in pain…..
“I am extremely sorry Maahi…I didnt do it intentionally…even I dont think to hurt u….if I hv any idea in it I wont ask that help….plz ..bcz of me u hurted badly…I am sorry”….she apologized coming to him….. He frowned at her….he didnt understand wt she said…. He was shocked for her claim…. “jo ab mein kahi wo sab dikhava hai Maahi….in fact I dont know why I made friendship with u…..I dont know why dont i get angry on u…..I dont know why dont I hate u….even I dont know why I am behaving like this with u……when I saw u I felt u r a familiar one to me….but why I felt I dont know…yesterday when I saw u in such a condition….I felt pain in my heart….but dont know why I felt it…when I saw u in conscious….I felt so happy ….I dont know why….I never felt that much happy even I succeeded in the business deals…sach mein yeh wahi feel hai tho I cant say it to u openly….I am sorry”…..
With his question she came to sense…she looked at Maahi…. “u r right Anvi…but the guilt is of mine nd it is eating me inside….I know how much Shiv loves Annika….wt she is to him….but now they both r facing the pain bcz of my foolish act”…he said with moist eyes…. “Plz yaar…”I am not convincing u Maahi…..even I wont blame u….if u want to cry then do it…but dont blame urself thinking that u r the reason for everything “….she said…. She clearly saw the hate in his eyes …. “no need to ask permission…wt do u want to ask u can that too with full rights”…he said..
“do u accept shakthi uncle as ur father”…she questioned observing his expressions…. His face faded with her question….nd turned his eyes from her but she noticed the anger in his eyes…. “Maahi plz…atleast tell me wt she is doing…I will try to get her whereabouts”…she pleaded…. “Anvi plz leave this matter”…he pleaded ..
“Plz Maahi ..not for me but for Shiv…plz”…she used Shiv’s name bcz she understood for Shiv ..he can do anything…. “Anvi…when she crossed her limits, planned to kill Shiv nd tried to implement it….I left her at that moment…truely I dont know about her”…he said with teary eyes…. Hearing it …she want to ask something but seeing his wet eyes she forgot about her doubt…. He looked at her ….her eyes are saying to him as I am with u if u want to rectify ur acts nd clear the damage that happened bcs of him…. He nodded in yes …. Maahi sat silently starring at her nd trying to read her…. After completing the call …..
“dont worry…I will stay here like a good boy”..he said observing her antics…. Before going out….she ordered maids to serve everything to sir in the room nd look after his needs…. Then she ordered her security …dont allow any one until her return….nd left…. Thank u guys for reading…. Plz give feedback to know ur views regarding the track…. ALL THE BEST TO THOSE WHO ARE ATTENDING EXAMS.. 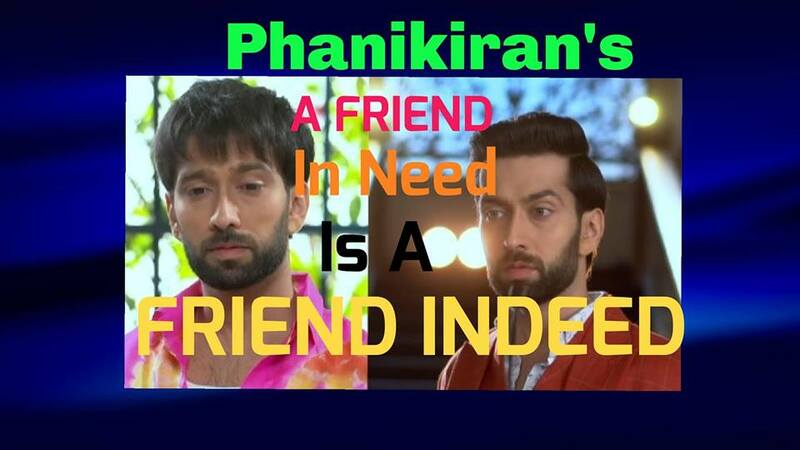 The post A FRIEND IN NEED IS A FRIEND INDEED(an Ishqbaaz fan fiction by PHANIKIRAN) Part# 31 appeared first on Telly Updates.